The missionaries who arrived in Lāhainā in 1823 explained to the Hawaiian Royalty the importance of an educational institution. In 1823, Kalākua Kaheiheimālie (ke Aliʻi Hoapili wahine, wife of Governor Hoapili) offered the American missionaries a tract of land on the slopes surrounding Puʻu Paʻupaʻu for the creation of a high school. Betsey Stockton from the 2nd Company of Protestant missionaries initially started a school for makaʻāinana (common people) and their wives and children on the site. When Lahainaluna High School first opened, Lāhainā was the capital of the kingdom of Hawaiʻi, and it was a bustling seaport for the Pacific whaling fleet. Under the leadership of Reverend Lorrin Andrews, the school was established by the American Board of Commissioners of Foreign Missions “to instruct young men of piety and promising talents”. It is the oldest high school west of the Mississippi River. In September 1836, thirty-two boys between the ages of 10 and 20 were admitted as the first boarding students, from the neighbor islands, as well as from the “other side of the island”; thus, the beginning of the boarding school at Lahainaluna. The boarding program became coed in 1980. The two dorms are David Malo Dormitory for the boys and Hoapili Dormitory for the girls. Previously, Hoapili housed both genders. Lahainaluna is one of only a few public boarding schools in the nation. The missionaries soon saw that the future of the Congregational Mission in Hawaii would be largely dependent upon the success of its schools. The Mission then established “feeder schools” that would transmit to their students’ fundamental reading, writing, and arithmetic skills, and religious training, before admission to the Lahainaluna. Initially, Hawaiian was the language used in instruction; in 1877, there was a shift to English. The students engaged in a variety of studies including geography, mathematics and history to prepare them for leadership roles in the Hawaiian community. Lahainaluna was transferred from being operated by the American missionaries to the control of the Hawaiian Monarchy in 1849. By 1864, only Lahainaluna graduates were considered qualified to hold government positions such as lawyers, teachers, district magistrates and other important posts. A notable structure on the campus is Hale Paʻi (the house of printing,) a small coral and timber building. Starting in 1834, it served as the home of Hawaiʻi’s first printing press. Hale Paʻi is associated with a number of “firsts” in Hawaii. The first actual publishing in Hawaiʻi was done in Honolulu in 1822. It was at Lahainaluna, however, that the first newspaper ever printed in the Hawaiian Islands was published on February 14, 1834. This paper, called Ka Lama Hawaii (The Hawaiian, Luminary) was also the first newspaper published anywhere in the United States or its territories west of the Rocky Mountains. Also published at Hale Paʻi for the first time were many portions of the first Hawaiian translation of the Bible, the first English translation of the first Hawaiian Declaration of Rights, the first Hawaiian Constitution, the first set of Hawaiian laws on property and taxation, the first Hawaiian school laws, the first paper money engraved and printed in Hawaiʻi, the first history of Hawaiʻi printed in Hawaiian and the first history of Hawaiʻi printed in English appearing in the Islands. In 1834, Lahainaluna students first began engraving on copper plates. The initial purpose of this engraving was to provide maps for study, not only at the Seminary, but at schools throughout the Islands. In the 1840s commercial development in Hawaiʻi – both trade and agriculture – began to take off. As business grew, so did the need for money. At this time, the nation had no official currency of its own, relying instead on a variety of foreign coins and bills which circulated at an agreed rate of exchange based on the U.S. dollar. As early as 1836, private Hawaiian firms began to issue paper scrip of their own redeemable by the issuing company in coins or goods. In early 1843, apparently, Lahainaluna first printed and issued its own paper money. Its primary purpose was evidently to pay the students for their work on the campus (up to 25 cents per week,) which was then used for payment of their rent and tuition. Later, counterfeiting of the school’s currency was discovered. Then, the faculty, in accordance with their vote of January 8, 1844, called in and destroyed all the paper money they could find. Then, authorized the addition of secret marks to all the new currency and re-issued it. In 1903, Lahainaluna became a vocational trade school and, in 1923, a technical high school, admitting both girls and boys as day students. It continues today as Lāhainā’s public high school. The image shows copper plates of the Lahainaluna currency. In addition, I have added other images in a folder of like name in the Photos section on my Facebook and Google+ pages. The Hawaiian Mission Houses Historic Site and Archives has the ‘Engraved at Lahainaluna’ book – I have a book and refer to it often – you can order yours . Click Here. Here’s a story on the ‘Engraved at Lahainaluna’ book – Click Here. Like any town with wooden buildings built side-by-side, folks in Lāhainā in the early-1900s were always wary of the possibility of fire getting out of control. Then, it happened. New Years 1919, a fire (which broke out earlier New Year’s Eve) started in the Sing Lung Co. fruit store, “two doors from the corner of Front and Church streets, on the mauka side” and grew to engulf a large part of the business center of the town. More than 30 separate buildings were destroyed before the fire was stopped by the townspeople who turned out in the middle of the night to try to battle the blaze after a mounted police officer gave the alarm by riding around town frantically blowing his whistle. The fire appeared to be intentionally set. The community helped control the spread and the Maui News specifically praised the heroics of a Japanese boy named Aoki who saved the historic Baldwin House. The big fire of 1919 destroyed all of the wooden buildings along Front Street from Dickenson Street to the Lāhainā Store, which was spared. 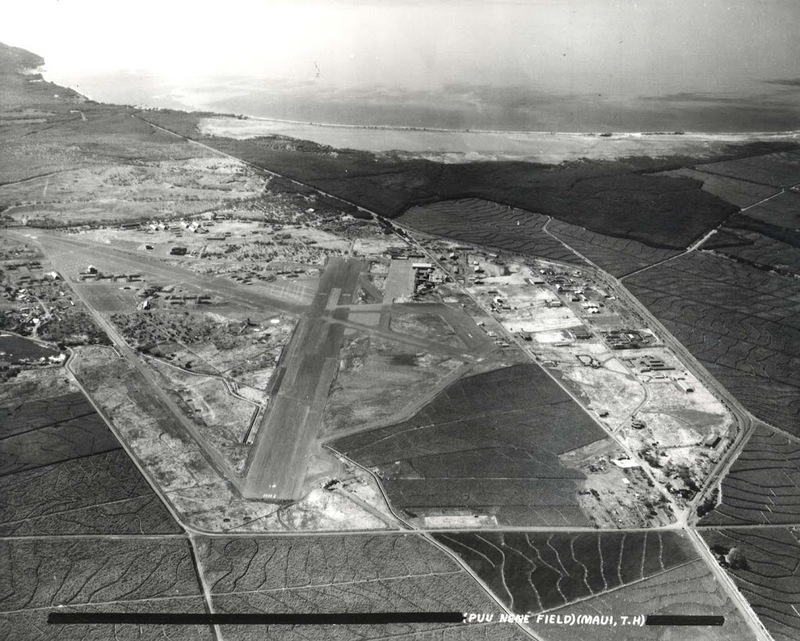 Starting at Dickenson, those stores were: Yee Lip General Store, Sing Lung Fruit Store, Wa Sing Barber Shop, the Lāhainā Branch of Bank of Hawaii and Len Wai Store. The buildings in what was called Library Park were also destroyed; the Japanese Hotel owned by M. Shimura, Yet Lung General Store, the Goo Lip Building, several small businesses, shacks and the fish market. The Pioneer Hotel was seriously threatened, although some distance from the fire, by the shower of sparks carried upon it by the wind. By keeping the roof wet with water carried up in buckets, it was possible to prevent its catching fire. The Lāhainā fire was not only started by burglars, who broke into the Sing Lung fruit store, stole a number of watches and about $8 in coin, but that the crime was committed by members of the gang of young bandits who robbed the Len Wai Co., store and planned to rob the Lāhainā bank. The fire, considered one of the worse in the history of Maui to that date, was the catalyst for important improvements to Maui urban life. The following month, the County Board of Supervisors approved and funded the start of a fire department for Lāhainā. BO Wist was elected as the first fire chief and given the job of organizing a volunteer fire company. The Board went on to approve the purchase of two fire trucks – one for Lāhainā and one for Wailuku. Within a short time after the fire started the leading Japanese of Lāhainā had formed a relief organization for the benefit of those who had suffered loss from the fire. The first work of this organization was supply food and drink to the hundreds who were engaged in fighting the fire. Later, it took up the matter of helping those sufferers of the fire. 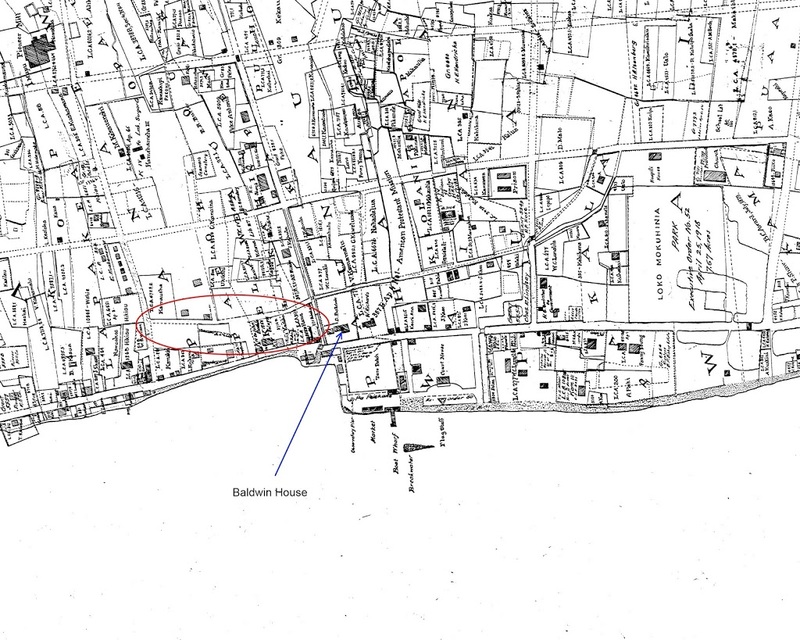 The image is an 1884 map of Lāhainā with the general location of the fire noted, as well as the location of the historic Baldwin House. There is a trail that leads along Kaʻuiki Hill to a red sand beach pocket. Along this trail is a plaque marking the site where Queen Kaʻahumanu was born in a nearby cave. She was the favorite wife of King Kamehameha I. 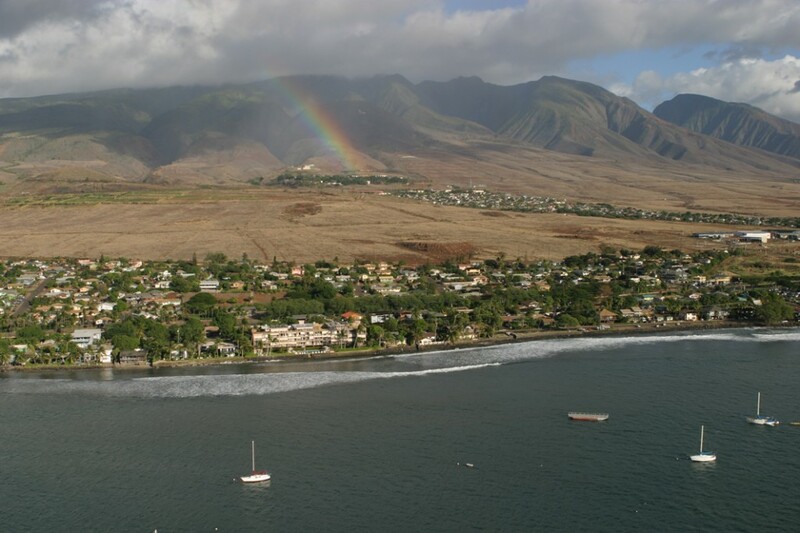 In 1790, Kamehameha invaded Maui, landing and winning a battle in Hāna. He worked his way north from Hāna and engaged Kalanikūpule’s armies at Hāmākualoa in the battle of Pu‘ukoa‘e – and then at ‘Īao Valley in the famous battle of Kepaniwai. The church started with a thatched structure and by 1842 work commenced on the present building. Wānanalua Church is a large stone building, the walls of which have been plastered over. Stone for the church was gathered from the ruins of a heiau, and the original roof was thatch. The framing timbers came from the mountains and coral was gathered from the ocean and burned for lime and used to make mortar. 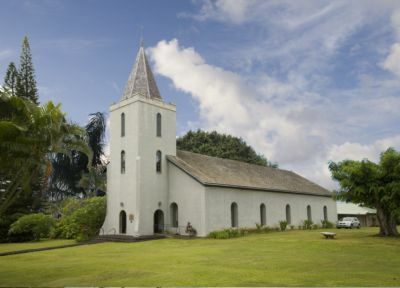 It is typical of the churches of this period in that it was constructed of local materials by Hawaiians under the supervision of a missionary, and was built to serve the Hawaiian community. Services were held in the Hawaiian language until the 1930s. The church sits conspicuously on a large lot surrounded by a lawn with scattered plantings. A lava rock wall separates the church lot from the street. The roof was reframed in 1856, which allowed for a shingle roof to be installed in 1862, replacing the thatch. In 1897, the building was reroofed, refloored and replastered. It is assumed the bell tower was also constructed at that time. The church has remained in continuous operation and is one of the better maintained nineteenth century stone churches on Maui. 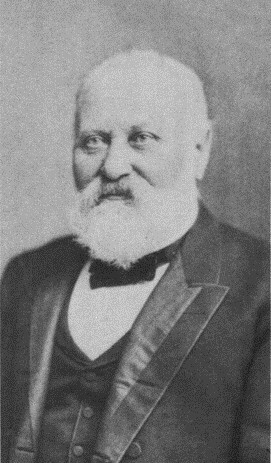 Daniel Conde and his family were the first missionaries to permanently settle in Hāna, which remains a somewhat remote part of Maui, even today. The Condes remained in Hāna until 1849, when they moved to Wailuku. After the death of Mrs. Conde in 1855, Daniel and his children returned to New York. The Wānanalua Church and the Hāna Courthouse are the only two surviving structures from the nineteenth century left in Hāna. I have added other images in a folder of like name in the Photos section on my Facebook and Google+ pages.